December 2014 – Jacobs and Company B.I.T.S. Your network is the nerve center of all of your IT and like that new puppy or kitten under the Christmas tree it requires regular care and feeding to keep it healthy and happy. The network infrastructure consists of several parts: switches, wireless access points, routers, and firewalls are the most common. These devices have the job of connecting all of your devices like computers, servers, printers, and tablets so they can communicate and share data. When these devices fail that communication you depend on to connect your employees to your data and to the internet is disrupted. Proper care and maintenance can improve the life span of this equipment and ensure optimum performance throughout the life of these devices. 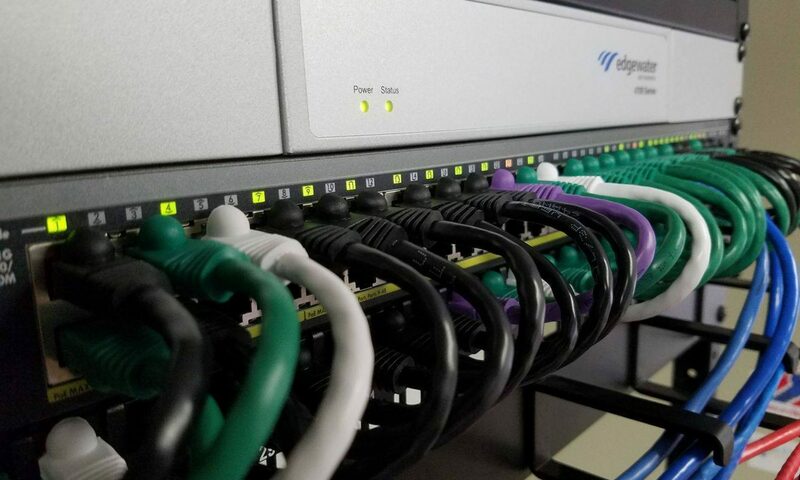 A neat clean installation is the first step to properly caring for your network equipment. Routers, switches, and firewalls should be mounted in a rack or on a shelf that allows for good airflow and ventilation. This shelf or rack should also provide a route for network cables to neatly reach the ports on the device while providing support for the cables so they are not strained when hanging from the ports. Bundles of network cables plugged into the ports of a network switch can become very heavy and this weight can cause connections to become loose or damage the cables and device ports over time. A patch panel can help provide organization and a clean termination for all the wire coming into the network closet or server room. Shorter patch cables from the panel to the network device can be easier to route through strain relief tracks that can be added to a network rack. Properly bundling cables together helps keep the airflow going in a rack and prevents heat from being trapped around the network devices. Heat is probably one of the biggest threats to your equipment. If the room or closet is warm you should install a standalone cooling unit or an exhaust system that will draw in cooler air and vent the warm air created by the equipment. All of this equipment consumes electricity and the better the power you feed it the better it will perform. Fluctuations in the power coming from the wall can cause routers to do very strange things…the more technical term here might be weird. The power coming out of an outlet can fluctuate wildly like water pressure it can go high or it can go low giving you an average. Most of the devices you plug into an outlet can handle some variation but network equipment can have major performance issues that can be traced directly to minor fluctuations in power. Major fluctuations like a surge or a brown-out can even destroy electronic components. Installing a good battery backup or UPS will smooth out any fluctuation in the power and will protect the equipment from surges and brown-outs. The backup battery will also keep your network up in the event of a total power failure giving you time to save your work to the server or for backup power systems to kick in. Many of the devices on your network have gotten smarter which means they have an operating system like your computer. Like your computer patches and updates that improve performance, reliability, and security. Regularly checking for updates for these updates is an important part of maintaining your network equipment throughout its life. A well cared for switch should last a good 6-7 years at which time you should plan on retiring and replacing it. In this time frame the technology generally has improved substantially since your last purchase so an increase in performance and speed is usually your reward when it comes time to refresh your switches. I tend to recommend replacing routers and firewalls on a slightly shorter cycle because these devices typically provide security. Keeping these devices longer than the manufacturer intends to support them opens your network up to security risk. Replacing routers and firewalls about every 5 years will generally keep you within the manufacturer’s extended support period during which they continue to provide security updates. In order to get the most out of your network devices you can’t just set it and forget it. Proper maintenance and care will ensure that your equipment is performing at the top of its capability. Having a retirement and replacement plan in place will help ensure you are always improving the speed of your network and reduce the risk of having older equipment fail unexpectedly leaving you unable to use the resources on your network your business needs. Open your network closet today and get a plan in place today for better management of your network equipment. Last month we talked about whole disk encryption and I promised a walk-through on how to turn on BitLocker drive encryption on your Windows computer. Before we dive in I want to remind you about some of the requirements for BitLocker. BitLocker is only available on certain versions of Windows, and these are: Windows 7 Enterprise, Windows 7 Ultimate, Windows 8.1 Pro, and Windows 8.1 Enterprise. BitLocker also defaults to requiring a Trusted Platform Module or TPM chip inside the device. There are ways around this final requirement that might actually provide better security but we won’t get into that right now. So we need to head for the Control Panel first. In Windows 7 click start and then on the right hand column of the start menu click Control Panel. There you will find the BitLocker applet which you can double click to open. In Windows 8.1 the easiest way to get here is to click the search icon at the top right of the Start Screen and type BitLocker. The same search can also be done from the Start Menu of Windows 7. Now that we have the BitLocker applet open we can get started. You should see your drives listed on the main page of the applet. Under each drive grouping you should see a link to turn on BitLocker. Clicking that link will start the wizard that will prepare the machine to encrypt the drive. The wizard will first check to see if BitLocker can run on the device. It is looking for that TPM I mentioned earlier. Assuming you have the requisite TPM the wizard asks you how you would like to unlock your drive. Unlocking the drive basically decrypts the data for you to use while the device is on. You have 2 options: Insert a USB Flash Drive or Enter a Password. This is an important decision because you will need either the password you enter or the USB flash drive every time you turn on the device. If you choose a password this is separate from the login password you use to get into Windows and should be a different password. If you choose the USB flash drive you will have to have it with you to plug into the device whenever you turn it on. Now that you have chosen how you want to unlock the drive I am sure you want to know what happens if you forget your password or lose your USB flash drive. Microsoft has you covered in this next step. The BitLocker Wizard creates a recovery key you can use to decrypt the drive in case you can’t unlock the drive. There are several options including saving the key to your Microsoft Account. If you have full faith in Microsoft choose this option but not knowing who else might be able to access this data at Microsoft I would caution against this option. I would recommend however choosing at least 2 of the other options before clicking next and moving on. My personal favorites are printing and storing the print in a secure location at your office and saving to a USB Key and storing it in another separate secure location like a safe at home. The final step is to choose if you want to encrypt the entire drive or just the used space. Choosing to encrypt the used space leaves the empty portion alone and encrypts new data as it is added to the drive. This is ok if you are encrypting a new device. If you have been using a device for a while previously deleted items may still be located on the hard drive just invisible because that space is now marked as unused so new data can be written over top of it. Choosing to only encrypt the used space leaves this “invisible” data vulnerable to a savvy thief. So if you have been using the device you are encrypting for a while going ahead and choosing to encrypt the entire drive is your best bet. Make your choice and finish up the wizard. A restart is in your very near future. The encryption process takes time and a lot of system resources which slows down the machine. It can also take a good bit of time. I recommend doing this when you will not be needing to use the computer for a few hours while it does its work. Maybe before bed or at the end of the day before you leave the office? You can encrypt other drives in your computer with BitLocker as well as portable drives with what is called BitLocker To Go. This way you can copy files onto a flash drive or an external hard drive that has been encrypted and rest easy knowing if the drive is lost your data is still safe. I got a text the other day from my wife with 3 small words I thought would never come from her, “Cancel the cable.” All I could say in return was “Wait, what?” I was shocked and a little confused because she had been so resistant in the past but she was finally fed up with our cable TV service. We had recently talked about switching our TV service to satellite but couldn’t really see any cost benefit or value for the money we would be paying. The recent loss of several channels we watch, especially channels my 3 kids watch started the ball rolling forward that led my wife to the ultimate conclusion that we should cancel the cable. This poses a special problem that falls to me to solve. How do I “cut the cable” and still keep the remaining programming my family enjoys? The Cloud, it is nearly all out there in the cloud. Ahh research, boy have I done a lot of it in the last few days. I almost immediately began looking at trying to get our local broadcast channels over the air…then I realized the content we watch from those stations isn’t the local news content it is the national content. ABC, NBC, CBS, FOX, CW they all provide their content online or through an app. I found apps for all of these stations available on both Android and Apple mobile devices. Even some of my favorite cable channels are in on the act like TNT and Syfy. There are some sticky issues with some content providers, take TNT for example. I discovered their app — it was great but watching required me to log in with my username and password from my cable provider. This is not uncommon. Several channels require you to have a pay TV subscription to watch. Well that may be a problem when I drop the pay TV portion of my cable service. This is not the only sticky issue I have discovered. CBS for example only has certain episodes available to stream, unless you subscribe to their service to unlock additional content. They aren’t the only content provider using this model either. Subscribing to particular content providers seems to cost in the $5-$7 range per month. Disney has even gone a step further. They require a pay TV subscription to stream content, but if you are a Star Wars fan like my kids and I are Star Wars Rebels is available on YouTube for $1.99 per episode or you can get the entire season for $15.75. It is also available on iTunes, Google Play, and Amazon. The point of all this is that new services and ways to access the content you want to watch are popping up every day in the cloud and the industry is trying to figure out how people are willing to pay or not for the content they want when they want it. Now I would be remiss if I didn’t mention popular streaming services like Netflix, Hulu, and Vudu which are kind of like the cable companies of the internet. Netflix is developing its own fantastic original content and working with companies like Marvel Studios to bring original content like a live action DareDevil series to their streaming media service. Hulu has movies and recently aired TV shows available usually within a week of their air date to stream as part of their service. Vudu allows you to rent or purchase streaming movies and seasons of popular TV series individually much like iTunes or Amazon. We already have a Netflix account and the kids love it. It will certainly be an adjustment to how my wife and I think about TV and how we watch it. My kids are growing up with streaming media so I doubt they will fight the transition that much. With devices like Roku and Apple TV the content they are streaming to their devices can also be enjoyed on their TV using wireless video streaming technologies like Airplay and Miracast. So with minimal gnashing of teeth we will be “cutting the cable.” How about you? The Surface Pro 3 never ceases to amaze me with everything packed into its slim form. This nifty little trick up the Surface’s sleeve is no different. The surface can stream video wirelessly to monitors, media devices, and TVs that support Miracast. I know Apple does this with Apple TV and their latest Macs and displays but Miracast is one of 2 competing technologies that allows the rest of us to stream our displays WIRELESSLY! Sorry I got a little carried away there. Ok so what do we need to perform this magic of over-the-air video? A display that supports Miracast. I want to use my TV…It doesn’t support Miracast, but that Roku box I have been eying does and it is a lot less than a new TV, SCORE. Maybe a Roku isn’t the right solution. Microsoft has a wireless display adapter that is USB powered and is compatible with Android devices that support Miracast. Plug this little baby into your HDMI port and the USB in to a powered USB port on the display and you are ready to go. This would be great in a conference room or for a projector. There is a plethora of Miracast receivers out there so Google away until you find one you like. Check out this review of the Best and Worst Miracast adapters of 2014 to get you started (http://www.tomsguide.com/us/miracast-receivers,review-2284.html). Ok so we know what extra hardware we need to get our display from the Surface wirelessly to an external monitor or TV. The next question is how do we do it? Well it is really simple. From the Start Screen swipe left from the right edge of the screen. Now tap Devices then tap Project. Windows will have detected nearby wireless displays so now tap Add wireless display in order to pair with one. Now you can choose how you want to display on the second screen. You can choose to have it duplicate what is on the Surface display, Extend the display like at your desk when you have multiple monitors, or to just use the external display making the tablet display go off. The third option doesn’t make a lot of sense with a tablet so I think sticking to Extend and Duplicate are our best bets in most cases. So why am I so excited about wireless displays? Think about what you can do with your tablet if the screen was 60″ and not trapped in your hands. You could easily share pictures and videos with guests and family all at once without playing a rousing game of pass the tablet. You know what I am talking about. You play a video for Aunt June and she tells Nana you have to see this, and then Uncle Jed and all his kids want to see and suddenly it’s been an hour and you have no clue where your Surface went. I usually find mine in one of my kids’ hands hiding under a table playing games. Speaking of games how about trying to play your favorite game on a much bigger screen. Then there are the obvious work related uses. Displaying a document or presentation on the TV in the conference room quickly comes to mind. This is a really cool feature that is really built into Windows 8.1 but is much more useful when paired with a device like a tablet. Wireless display isn’t great for really high quality video playback or fast-paced gaming because the refresh rate is still a bit on the slow side but for most applications and other display applications this is a great feature to find hiding away in the Surface Pro 3. I have had several opportunities to set up Surface Pros up for clients since the first Surface was released 3 years ago. I have finally been able to get my hands on my very own and I have to say I am just as impressed with this one as I was with the ones I set up. The Surface Pro 3 runs Windows 8.1 which for many is a turn off but I love it. Once I got used to a few navigational quirks I was off to the races. But getting started was easy all my apps where presented to me on the start screen and I was able to quickly move between the desktop interface and the Modern UI of Windows 8.1. I highly recommend Windows 8.1 for your next Windows device (desktop, laptop, or tablet). This is not a Windows 8.1 review even though much of the tablet’s functionality is due to the operating system. Then first thing I did when I turned on the Surface was to complete the set up wizard which was simple and straight forward. I was asked to choose a language and to join my wireless network. Towards the end of the process I was asked to supply my Microsoft ID and password. This is an important step because your Microsoft ID is what links your device to the world of Microsoft cloud services, much like an Apple ID for iPad. If you don’t have an ID you can create one, they are free. You also have the option of creating a local account though I don’t recommend this option. Once I finished the setup wizard I logged into my Office 365 account and installed Office 2013. My favorite Office application has quickly become OneNote. With the stylus I can take natural handwritten notes, sketch out ideas, and convert handwritten notes to typed text automatically. The stylus works perfectly with the palm blocking technology allowing me to lay my hand on the screen as if I was writing on paper. OneNote comes with the Surface so even if you don’t have office you can enjoy this powerful application. I have played video from services like YouTube and Netflix as well as run some graphics editing software on the tablet and it has performed flawlessly so far. I have not experienced any lag or lockups. As for Office I am writing this article on the Surface in Office 2013 saving directly to my OneDrive and the experience has been great. I take that back… one thing would true,y make this tablet a laptop replacement and that is a type cover. I have been using the onscreen keyboard however in writing this article just like when one I wrote on the iPad a few months ago an external keyboard is needed for prolonged typing tasks. The Surface Pro 3 offers the best of both worlds a full Windows 8 Pro experience in a light portable tablet form factor. The smooth response and large crisp display are a joy to use and I would recommend this device to anyone who is looking to upgrade or replace the laptop they carry today with a sleek modern tablet. Be prepared for a slight learning curve with Windows 8.1 but don’t be afraid of it. Microsoft provides plenty of short 2-5 minute video tutorials to help you get started quickly. Every business wants to be paperless. We spend an exceptional amount of time and money to get to that point where our forms and files are all generated and stored electronically then we print out a contract or other document that needs signed and suddenly we have paper again. Paper that needs to be scanned and filed both electronically and in a paper file. Sometimes even multiple copies of the signed document are made, further increasing the paper that has to be filed and maintained. This entirely defeats the benefits of “going digital.” When thinking about your paperless process it is important to also consider what processes might force a document to go from digital to physical. Signing documents is one of those processes. With a little planning you can implement digital signatures across your entire organization for internal documents as well as for agreements with clients and other 3rd parties with whom you do business. Let’s look at an internal document for example such as an expense report that needs to be signed by both the employee and someone authorized to approve the expenses. The simplest way I can think of to sign this document would be to just insert an image of your signature and place it over the line saved for your signature if you had printed the report. This method also works well for letters and email signatures. What about for more important documents like a contract for example? Digital signatures created using a digital certificate add a number of features that ensure the security and integrity of a document. PDF documents are in my opinion the best type of document for this type of signature; however, Microsoft documents all support digital certificate signing. Here is how signing works with a PDF. Your chosen PDF reader has a tool for creating a digital signature also sometimes called a digital ID. There are a few steps involved that include selecting the digital certificate you want to use, adding text, and/or an image to your signature. Once your digital signature is created you can use it to sign almost any PDF document. After you sign the document the document is secured. Information about the certificate and how it can be verified are stored inside the document as well as when the signature was attached. From this point forward if there are any changes to the document the signature becomes invalidated and informs anyone who opens the file of that fact. PDF documents support multiple signatures without invalidating the other signatures on the document. I mentioned a digital certificate. A digital certificate is a file that is stored on your computer or mobile device that uses a public and private key to encrypt data and verify the validity of the certificate. You can create self-signed certificates for testing using applications downloaded from the internet. Windows even has a server role you can install to set up your own certificate authority for creating these digital certificates. I recommend however that if you need a digital certificate you go to a company like VeriSign, Symantec, or Comodo and purchase one. When you purchase a certificate from one of these providers you go through a verification process to ensure that you are…well…you. This also provides a level of security for other parties to the contract who want to make sure you are the one signing. While setting up your own digital identity and obtaining your own personal digital certificate is a great way to sign and secure documents, I highly recommend you set this up. Requiring that your clients get digital signatures might however provide a barrier to them doing business with you digitally. Happily, there is a solution — as a matter of fact there are multiple solutions in the form of cloud services that simplify the process for all parties involved. My personal favorite is DocuSign, but there are at least a dozen others from which to choose. With these services you just upload your document and set it up for digital signatures using their web interface. Then the service sends links to all parties involved who need to sign the document. Once everyone has signed another link is sent to allow everyone to download the fully signed and executed documents for their records. But that’s not all. The document is signed with a digital certificate securing it from future changes. The certificate is given a serial number that links back to DocuSign’s database that provides a complete audit trail of the entire process that can be admitted as evidence in court if the contract is ever disputed. Using a service like this requires no special tools, software, or certificates, removing the barriers to adopting digital signing to almost any signature process. Electronically captured images of signatures and certificates are not the only way to digitally sign something. A record in a data base that includes some personally identifiable information and a field that attests true to your intent to sign an agreement is also considered a valid digital signature. For example, when you signed up for that iTunes account when you got your first I phone you had to enter information about yourself and click a button or check a check box saying you agreed to their terms of service. Apple recorded that personal information in a database along with a checkmark in a column that says you agreed to their terms of service. You might not have realized it but you signed a digital contract when you agreed to those terms and conditions by just clicking a button. Digital signatures have been recognized by the federal government for nearly 15 years as valid and have since been proven time and again to hold up in court. It is time to take your business to the next level and begin implementing digital signatures into your paperless workflow so that you can stop printing and filing all that paper. Securing your data is done in layers. Usually we talk about firewalls and antimalware but just as important in our highly mobile world is drive or disk encryption. Most mobile devices support encrypting all the data on the device, and many even come set up this way by default. The reason is because we carry so much data on our mobile devices that we need to be able to ensure its security. What about laptops and flash drives though? Do you have client files on your laptop? Do you have a backup of Quickbooks on your flash drive? What if either of these is lost or stolen? Is the data safe? Drive encryption or whole disk encryption allows you to encrypt every file on your computer or a flash drive so that a password or key is required to read those files. On a laptop there is usually a special security chip called a TPM that requires a password in order to boot up the computer. Once you enter the password you are able to access the files and the laptop boots up normally. Where having the drive encrypted comes in handy is if someone removes the hard drive from your laptop to try and get at the data directly. All the thief gets is gibberish and the data is useless because they don’t have the key to decrypt it. The same is true if you encrypt a flash drive. Without the key or password the data is scrambled and unreadable. Now encrypting these devices not only protects the data but some states even have “safe harbor” clauses in their data breach notification rules that say if you lose a device that contains client information and the device is encrypted you are exempt from the notification requirements of the law. I would recommend checking with a legal professional to better understand your local data breach notification rules and laws. Many of today’s modern operating systems include tools for providing whole disk and removable disk encryption. Windows 8 Pro, Windows 7 Ultimate and Enterprise, and Vista Ultimate and Enterprise include Microsoft Bitlocker to provide disk encryption. Mac OS X Lion has FileVault2 for whole disk encryption. There are also 3rd party tools like Symantec Drive Encryption that you can also use for Windows systems that do not include Bitlocker. Drive encryption is a great way to stave off the loss of data; however, if something goes wrong and you lose your key or for some reason you get totally locked out of your system by the encryption software (yes this can happen) having a good backup of your data is very important. If you do have data on encrypted laptop that isn’t backed up some place you should certainly start backing that data up. To also keep that data safe remember to encrypt your backup as well. Most cloud backup solutions encrypt your data both in transit and at rest on their systems. Next month I will share a tutorial on encrypting a flash drive with Bitlocker on a Windows 8.1 device. I have had several opportunities to set up Surface Pros for clients since the first Surface was released 3 years ago. I have finally been able to get my hands on my very own, and I have to say I am just as impressed with this one as I was with the ones I set up. The Surface Pro 3 runs Windows 8.1 which for many is a turn off, but I love it. Once I got used to a few navigational quirks I was off to the races. But getting started was easy — all my apps where presented to me on the start screen and I was able to quickly move between the desktop interface and the Modern UI of Windows 8.1. I highly recommend Windows 8.1 for your next Windows device (desktop, laptop, or tablet). This is not a Windows 8.1 review even though much of the tablet’s functionality is due to the operating system. The first thing I did when I turned on the Surface was to complete the set up wizard which was simple and straight forward. I was asked to choose a language and to join my wireless network. Towards the end of the process I was asked to supply my Microsoft ID and password. This is an important step because your Microsoft ID is what links your device to the world of Microsoft cloud services, much like an Apple ID for iPad. If you don’t have an ID you can create one, they are free. You also have the option of creating a local account though I don’t recommend this option. Once I finished the setup wizard I logged into my Office 365 account and installed Office 2013. My favorite Office application has quickly become OneNote. With the stylus I can take natural handwritten notes, sketch out ideas, and convert handwritten notes to typed text automatically. The stylus works perfectly with the palm blocking technology allowing me to lay my hand on the screen as if I were writing on paper. OneNote comes with the Surface, so even if you don’t have office you can enjoy this powerful application. I have played video from services like YouTube and Netflix as well as run some graphics editing software on the tablet and it has performed flawlessly, so far. I have not experienced any lag or lockups. As for Office, I am writing this article on the Surface in Office 2013 saving directly to my OneDrive, and the experience has been great. I take that back… one thing would truly make this tablet a laptop replacement and that is a type cover. I have been using the onscreen keyboard; however, in writing this article just like when one I wrote on the iPad a few months ago an external keyboard is needed for prolonged typing tasks. The Surface Pro 3 offers the best of both worlds — a full Windows 8 Pro experience in a light portable tablet form factor. The smooth response and large crisp display are a joy to use, and I would recommend this device to anyone who is looking to upgrade or replace the laptop they carry today with a sleek modern tablet. Be prepared for a slight learning curve with Windows 8.1, but don’t be afraid of it. Microsoft provides plenty of short 2-5 minute video tutorials to help you get started quickly. Recently I was asked the question, “If I where to start a new business what technology would I use?” This is actually a very good question and it forced me to think about what technology the average professional office needs to efficiently perform day to day tasks. Given most of the professional offices I work with are in the 5 to 10 employee range I will base most of my assumptions off of the needs of an office of this size. Every employee needs a computer, email, and access to productivity software such as word processing and spreadsheets. In more recent years social collaboration has also become a major benefit for businesses needing to develop content and work with a more distributed workforce. While not as important as it once was phones and fax still play a big part in day to day business activities. Beyond these basic needs each industry has its specialized applications that provide specific features required in that business’s work flow. My recommendation is to put as much in the cloud as you can. By using reputable service providers the cloud can provide even the smallest office with the scalability, availability, stability, and security of a large enterprise. These cloud services are staffed by highly trained technical teams that monitor and manage the software and hardware 24/7. The networks are run on high end hardware with ultra-secure settings the likes of which no small business could dream of affording. The other benefit of the cloud is that getting these services set up costs less upfront than buying and installing all of the hardware needed to support having it all set up in house. Also the monthly payment or annual payment plans allow you to plan and budget for your technology needs in a manageable way. Because you are paying a regular fee and everything is hosted in the cloud you also benefit from the provider’s team keeping everything up-to-date so you don’t have to do it. Now let’s talk about some specific solutions — phones and faxes seem like as good a place to start as any. Internet based fax has been around for quite a while; next to online backup I would argue it is one of the oldest cloud services. Companies like MyFax and eFax allow you to securely send faxes over the internet to a fax number as well as allow people to send faxes to you at your existing fax number. The magic is in the provider converting the data from the fax machine into a pdf or your document into data a fax machine can read on the fly. Phone systems have been making the slow and deliberate move from PBX to IP based systems that use the same network your computers do to share information. It is only natural that as Internet connectivity has improved that these voice over IP phone systems would find a home in the cloud as well. I work with a company called CommCore that provides hosted VoIP systems though there are many more like 8×8 and Switchvox by Digium that provide fully managed hosted IP based telephone solutions. These solutions are simple to install. Just plug the phone into your network and the provider takes care of the rest. Calls are routed over the Internet and then switched and sent out over telephone company lines to the number you called and the reverse happens when someone calls you. For email and productivity I believe Office 365 is the best solution available to any business. You get 5 licenses of Office for each employee to install on any device they use, a 50 GB mailbox on a fully managed and hosted Exchange environment, tools like SharePoint, OneDrive, and Lync for sharing and real time collaboration and communication for a low monthly fee per employee. Lawyers, accountants, and a host of other professional offices have software that is geared to specific functions in those industries. Most of these software providers are now providing their applications in a hosted environment that they manage and maintain taking the burden on maintaining, upgrading, and backing up off of the business. If you choose to still have some of your own servers these too can be made virtual and hosted in the cloud and the cost to do so is generally based on metered usage of resources like processor time and storage space. While most things can be pushed up to the cloud there is still a fair bit of technology you should have in house. As I mentioned, everyone still needs a computer, laptop, or tablet for accessing these cloud hosted services. You need a reliable internet connection, and I would recommend having a backup connection as well from a different provider. I would also still recommend a small server at a minimum to serve as a domain controller to manage security and configuration of the computers on your network as well as across your cloud services. Switches and wireless access points will still be needed to connect the equipment that is still located in your office. Along with the internet connection your router/firewall becomes more important as it is now the one device that provides your entire office access to all of the cloud services. It needs to be robust and secure and it needs to be able to support the redundant connectivity to the internet I suggested earlier. Another feature you might also want for your router is the ability to work in concert with another router that can takeover automatically should the first one fail. I fully believe the future of technology is in the cloud and understanding how using cloud services in concert with in house hardware and technology can help you build your business. The cloud allows you to expand beyond the walls of your office and provides access to employees and clients alike anytime, anywhere.